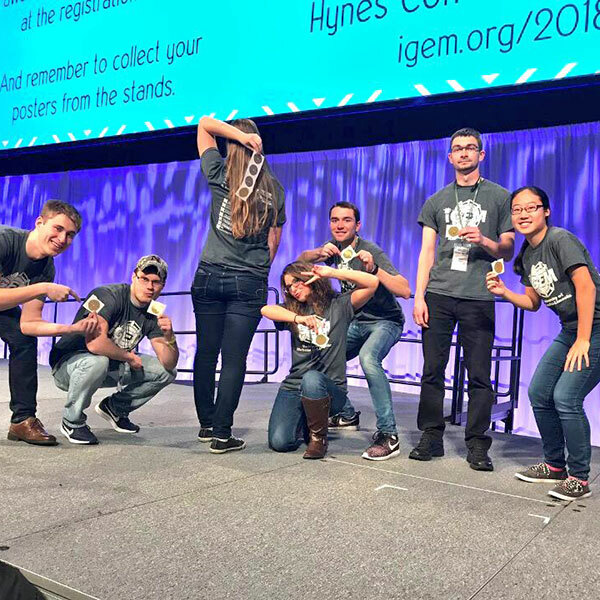 The University of Nebraska-Lincoln iGEM team earned a gold medal at the recent iGEM Giant Jamboree in Boston, Massachusetts. The University of Nebraska-Lincoln was honored with a gold medal at the International Genetic Machine (iGEM) Foundation Giant Jamboree, an international conference and competition which ran Nov. 9-13 in Boston, Massachusetts. The Nebraska team, comprised of five engineering students, a chemistry student and a high school student, was honored for its work on a process to lower methane emissions from cattle by genetically engineering e. coli to change the microbiome of a cow so that it produces less methane. Among the team advisers are engineering faculty Myra Cohen, associate professor of computer science and engineering; Wei Niu, associate professor of chemical and biomolecular engineering; and Massimiliano Pierobon, assistant professor of computer science and engineering. More than 200 interdisciplinary teams from around the world competed at the event. The iGEM Foundation’s mission is to promote synthetic biological research.